The WS003SH has 64 MB of SDRAM, 128 MB of ROM (60 MB user-accessible), an Intel XScale Marvell PXA270 processor running at 416 MHz, a 3.7 inch VGA screen of 640 x 480 px, and a slide-out QWERTY keyboard. The W-ZERO3 runs on Windows Mobile CE, version 5.1.70 (Build 14406.1.1.1). During its service lifetime it received three firmware updates, the final version being 1.04a. 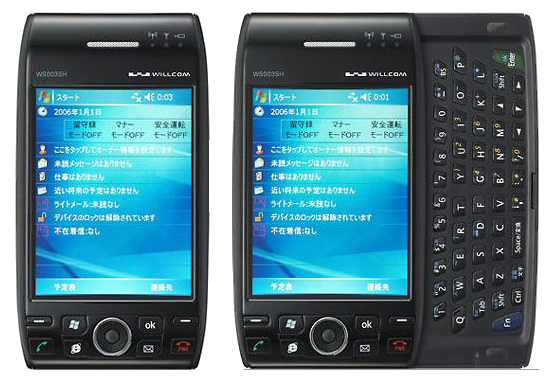 This pocket PC uses the PHS telephone system (only available in Japan) for voice and data connectivity. It is also equipped with Wi-Fi (b) and Infrared. Storage can be expanded using miniSD cards. The first of the W-ZERO3s came fully featured with Microsoft Internet Explorer, a special version of Opera, Outlook for email and calendar, Excel, Word, PowerPoint Mobile, Windows Media Player, ActiveSync, an app for handwriting, an image-viewer, XMDF e-book reader, calculator, and two games pre-installed (Solitaire and Bubble Breaker). Also pre-installed was an English-Japanese and Japanese-English dictionary as well as a Concise version Japanese dictionary and an English Business Letter Encyclopedia. The WS003SH weighs 220 grams and measures 70 x 130 x 26 millimetres. It was available in black, Champagne silver, gun metallic, and pearl white. I bought this device from Japan back in 2007 and I must say it was unlike any other. In fact, it is precisely the WS003SH that inspired me to build this website. W-ZERO FTW!